Milk Thistle, Silybum marianun, is native to the Mediterranean region. Milk Thistle gets its name from the milky white sap which comes out of the leaves when they are crushed. Milk Thistle has also been called St. Mary’s Thistle. It is available as a capsule, liquid extract, and tincture. It is thought that Milk Thistle has liver protecting activity. This plant is useful in protecting the liver in Alcohol-Induced Liver Damage, Hepatitis, Mushroom Poisoning, Acetaminophen Poisoning, and against other Drug-Induced Liver Damage. Silymarin, is a Flavonoid in Milk Thistle which is responsible for protecting the liver, due to its antioxidant and anti-inflammatory activity (UMMC). Silymarin is able to stabilize and assist in repairing liver cells (Sloan-Kettering). In a study conducted; Silymarin use improved liver function in individuals with Chronic Alcoholic Liver Diseases (Feher, Deak, and Muzes 2723-2727). Also in a study in which children receiving chemotherapy received Milk Thistle, lower levels of Amino Alanine Transferase and Aspartate Amino Transferase indicated less liver damage compared to children who did have Milk Thistle. Side effects from Milk Thistle are rare, and include upset stomach, diarrhea, and sometimes a rash if contact with made with the plant. 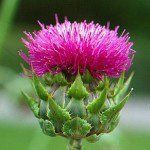 Milk Thistle is contraindicated in women who are pregnant or breastfeeding, or in individuals with a history of breast cancer, uterine cancer, or prostate cancer. Also, you shouldn’t take Milk Thistle if you are allergic to ragweed, and daisies (UMMC). Milk Thistle may also interact with drugs that are substrates of CYP3A4 and UGT (Sloan-Kettering). Feher, J, G Deak, and G Muzes et al. “Liver-protective action of silymarin therapy in chronic alcoholic liver diseases.” Orvosi Hetilap. 130.51 (1989): 2723-2727. Web. 29 Jun. 2012. Ladas, EJ, DJ Kroll, NH Oberlies, et al. “A randomized, controlled, double-blind, pilot study of milk thistle for the treatment of hepatotoxicity in childhood acute lymphoblastic leukemia (ALL)..” Cancer. 116.2 (2010): 506-513. Web. 29 Jun. 2012. “Milk Thistle.” Memorial Sloan-Kettering Cancer Center. N.p., 7 Mar 2012. Web. 29 Jun 2012. Ehrlich, Steven, NMD. “Milk Thistle.” University of Maryland Medical Center. N.p., 3 Apr 2011. Web. 29 Jun 2012.